This Minneapolis home nods to the architecture and feel of a log cabin. It blends in with its natural surroundings and provides a place to soak it up on the wrap-around deck. The refreshing re-side of the home’s exterior feels similar to the original, but looks much more polished and protected. From worn away and rotting wood planks to strong fiber cement planks that closely resemble wood, the home truly comes to life with James Hardie® siding and trim. The homeowners chose HardiePlank® lap siding in Select Cedarmill©, a soft texture with the genuine warmth of wood-grain, in the ColorPlus® Technology hue Chestnut Brown. The rustic shade adds an immediate boost in curb appeal, and the HardieTrim® boards in Navajo Beige lend delicate definition around the windows, sliding door, and accentuate the interesting shape of the home. Unlike wood siding, James Hardie siding and trim products resist the effects of moisture, damage from mold, and weather damage. With hot summers and cold winters, weather protection is an important consideration to a Minnesota homeowner. Thankfully, James Hardie has formulated home exterior products that take your region’s climate into account using the HardieZone® System. The system entails climate-specific product formulations for distinct climate zones, and there’s one product zone specifically for the Midwest – HZ5® product zone. 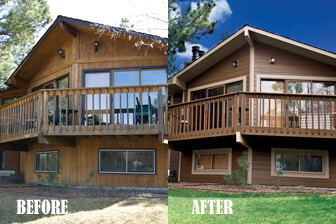 Wood may split, crack and deteriorate over time, but James Hardie’s high-performance products are engineered to last. Refresh your exterior with the powerful protection of James Hardie siding and trim—you’ll get the look of wood and the strength of cement.